If you’re looking for a midsize SUV that performs at the top of its class across all major automotive categories, you’ve stumbled across the right vehicle. The 2019 Buick Enclave has emerged as a crowd favorite among drivers and critics alike for its competitive features when it comes to performance, entertainment technology, luxury touches, and safety. Overall, it’s a well-rounded midsize SUV for the driver with a taste for luxury available at an affordable budget. Although it may look like a compact SUV, this midsize SUV has three rows of seating for up to 7 passengers. But what’s even more impressive is the cargo space offered for the 2019 Buick Enclave. With the vehicle full of passengers, all occupants can remain comfortable and have enough room for all of their belongings with a total of 23.6 cubic feet. Without passengers and the seats folded down, the Enclave provides up to 97.6 cubic feet of cargo space. For technology, the 2019 Buick Enclave is plentiful in terms of both safety and entertainment. In either category there isn’t much you can’t find on this SUV, and many of these features come standard or are available at a fair price. The same is true for both the Enclave’s luxury and convenience features, which include options like heated seating, a heated leather-wrapped steering wheel, Tri-Zone Automatic Climate Control, a 4.2-Inch Driver Information Center, and an in-vehicle air ionizer. If you’re in the market for a midsize SUV and have had your eye on the 2019 Buick Enclave, you’ve made the right choice. With this vehicle you can expect top-of-the-line features in every category, including performance, technology, luxury, convenience, and safety. When it comes to performance, the 2019 Buick Enclave offers drivers everything they expect from a midsize SUV and more. The Enclave comes standard with a 3.6L V6 engine paired with a 9-speed automatic transmission, producing up to 310 horsepower and powering its ability to tow up to 1,500LBS or 5,000LBS when properly equipped. Even with all of this power, the 2019 Buick Enclave maintains competitive fuel efficiency for a midsize SUV at 18 mpg in the city and 26 mpg on the highway. However, the area of this SUV’s performance that consumers and critics praise the most is its handling. As the 2019 Buick Enclave hits the market, drivers rave about the incredibly precise steering and smooth handling. Critics have also noted the Enclave’s power when it comes to acceleration, which is backed up by its impressive horsepower. 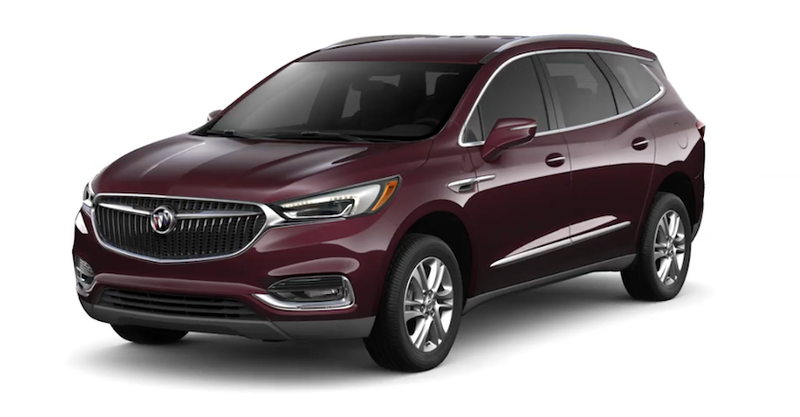 As for the drivetrain, the 2019 Buick Enclave comes standard in front-wheel drive but is available in all-wheel drive on every trim level except the base model. As is standard with most vehicles, upgrading to all-wheel drive will take about 1 mpg off each fuel efficiency rating. However, this still keeps the Enclave in the competitive field among its competitor in this category. If you’re wondering if all of this performance comes with the reliability to back it up, it does! The 2019 Buick Enclave comes with a four-year/50,000 mile warranty and a six-year/70,000 mile powertrain warranty. Surprisingly, that’s not all! Available in a total of four trim levels, the Enclave offers plenty of additional entertainment features with each upgrade. If you’re a tech-savvy driver looking for the latest technology or have a regular crew of passengers that need to be entertained, the 2019 Buick Enclave is sure to meet and exceed all of your expectations. No matter what you’re looking for in premium features, the Enclave is sure to have what you need and then some. With this midsize SUV, you’ll enjoy traveling the road in absolute comfort and style! One of the most convenient features of the 2019 Buick Enclave is its seating capacity, which comfortably seats up to seven with three rows of seating. This includes two captain’s chairs for second seating and a bench seat for the third row of seating. Each passenger is surrounded by a plethora of space for their own comfort, as well as to store personal belongings. In fact, even with every seat full, the 2019 Buick Enclave still offers an impressive 23.6 cubic feet of cargo space. Meanwhile, without passengers, drivers can enjoy 97.6 cubic feet of cargo space. Compared to others in its class, this amount of cargo space is one of the top contenders and truly offers drivers and passengers convenient options for long road trips and weekend getaways. Other available safety features include Forward Collision Warning, Low-Speed/Full-Speed Automatic Emergency Braking, Following Distance Indicator, Buick’s Safety Alert Seat, and Automatic High Beams. All of the impressive safety features onboard the 2019 Buick Enclave helped to earn it a 5-star overall safety rating from the National Highway Traffic Safety Administration, making it a midsize SUV that has proven itself to protect you and any passengers while on the road. 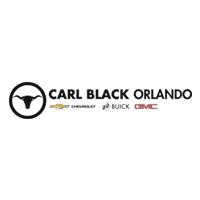 At Carl Black Orlando, we are eager to get you into the car of your dreams. When you shop at our dealership you’ll have our entire staff of automotive experts ready to help you along every step of the car-buying process. First, our customer service and sales team will help you determine which vehicles are best suited for your needs, lifestyle, and budget. Once you’ve chosen your ideal vehicle our finance team will step in and evaluate your desired monthly payments and help you set up the financing you need to drive off the lot. If you would like to set up a maintenance schedule for your new vehicle our technicians will be glad to help. And in the future, our service center will always be ready to serve you for any repairs you may need and with only the highest-quality parts. As your trustworthy local dealership, the team at Carl Black Orlando takes pride in finding our new and loyal customers their next vehicle. Whether you’re looking for a new, used, or certified pre-owned vehicle, our well-maintained inventory is sure to have a vehicle that suits your every need. So, when it’s time to find your next vehicle, look no further than the options at Carl Black Orlando! You can feel confident that you’ll receive a high-quality vehicle at the right price.